My favorite beach? That's easy. 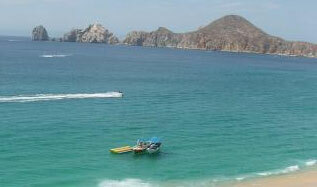 It's Medano Beach in Cabo San Lucas, Mexico. Why? Because it's the sight of so many fond memories. You see, I've vacationed in Los Cabos for almost twenty years. Years ago, my husband and I were young lovers strolling along the strand, our fingers laced, our hearts entwined, deeply in love with each other, the world and our commitment to a shared future. My kids grew up on Medano Beach. From toddlers examining chubby, sand-encrusted toes with a mixture of wonder and annoyance to young teens, strutting their stuff while pretending not to notice the girls who were pretending not to notice them. One sight, one sound, one nostalgic whiff of salt water carried on a balmy breeze and I'm transported back to my favorite time--my boys' "discovery years" ... their squeals and giggles, as I chase them down the wet sand into the surf, hoisting them up and holding their squirming, sun-soaked bodies close to mine, feeling the warm pressure of their skin, as I stride into the ocean and we brace ourselves for that initial shock of cold water. With chubby arms grasping my neck and legs wrapped around my waist, we laugh and bob together in the swell, surrounded by a cacophony of vacation sounds: merchants soliciting sunbathers in their heavily accented English with their trinkets held up high: "Hey, Lady! Good prices! ", rising cheers from nearby volleyball game, a jet ski whizzing by, warning calls from parents whose little ones are venturing too close to the surf. Medano Beach is vibrant with people, sights and sounds. But nothing beats its quiet beauty when you awaken early enough to witness the sunrise ... the sun a brilliant orb of glowing orange, an unmistakable tribute to yet another day in paradise. And of course, you can't forget the sunset ... streaks of pink, blue and purple, gathering into twilight, yet with one final blush that illuminates The Arch - "El Arco" the gateway between the Sea of Cortez and The Pacific Ocean located at "Land's End" at the tip of the Baja California Sur peninsula that might as well be a doorway into another world, so far it seems from the bustle of everyday life. This is why I love Medano Beach. I absolutely love Medano Beach too! When I went to Cabo last I stayed at the most wonderful resort, you should check it out if you are considering staying in Cabo San Lucas.